Xiaoly Li is a poet, photographer and former computer engineer who lives in Massachusetts. Prior to writing poetry, she published stories in a selection of Chinese newspapers. Her photography, which has been shown and sold in galleries in the Boston, often accompanies her poems. He poetry is forthcoming in J Journal and appeared in Off The Coast, and Gravel. She currently studies poetry with Barbara Helfgott Hyett. 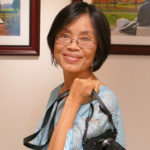 Xiaoly received her Ph.D. in electrical engineering from Worcester Polytechnic Institute and Masters in computer science and engineering from Tsinghua University in China.